The Halogen Ban announced by the European Commission will come into effect next month and it is only a matter of time before you will have to buy LED (Light Emitting Diodes) substitute for your lamps and chandeliers. The ban concerns mains voltage lamps including E27 and B22 cap types. September 2018 is bringing huge changes to the lighting industry, so now is a perfect time to learn more about how your household will benefit from this lighting revolution. Some of you might remember that when incandescent lights were first banned, LEDs were not up to scratch and it was difficult to find good quality substitutes. Luckily, LED lighting has come a long way since then and is much better, more powerful and in fact are of better quality than halogens. Let us walk you through the most commonly asked questions we have heard over the past week. 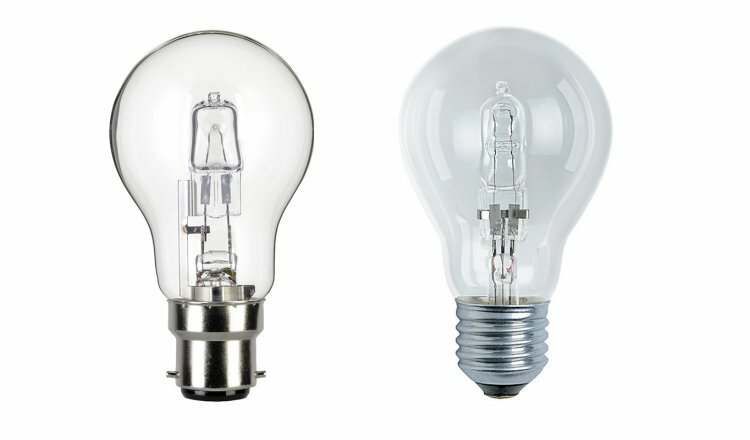 Which bulbs will be discontinued? The halogen ban concerns halogen lamps with E27 (standard screw bulb), B22 (also known as ”push and twist” and “bayonet cap”) fittings, often found in table lamps, floor lamps and chandeliers. How to choose LED substitutes? All of the banned halogens have their LED fitting substitutes and are easily replaceable. 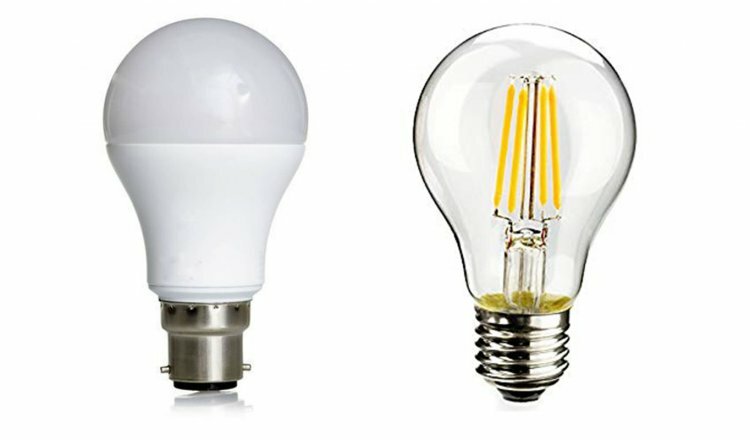 Many supermarkets have a wide variety of good quality LED bulbs, including the LED Filament bulbs closely resembling traditional tungsten incandescent light bulbs. Make sure to check how many lumens your new bulb has (the greater the number the better the light output) and what is the colour temperature it offers. Lumens let you buy the amount of light you want so when buying your new bulbs, think lumens, not watts. Colour temperature may vary, but try to stick to anything between 2400 kelvin if your house features wooden finishes, 2700 kelvin if your interiors have a lot of white and greys and 3000 kelvin in extremely dark or very modern spaces to achieve the best effect in your home. If you are after a more high-end solution, consider bulbs such as Calex (often recommended by high end decorative lighting designers) or Philips Hue which can be operated with your phone. Although it sounds like you are being deprived of something and are forced to buy more expensive LED bulbs, the halogen ban is in fact a great opportunity to upgrade your lighting and save some money. 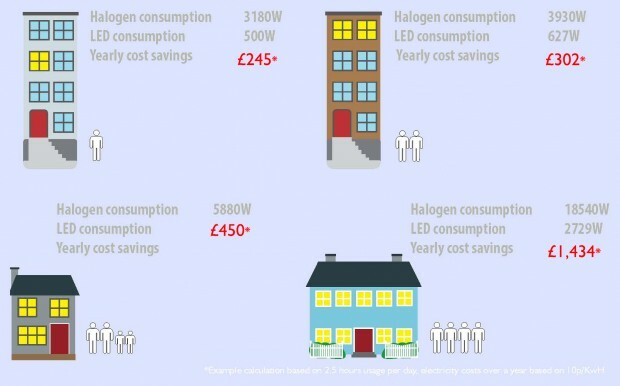 Although initially more expensive (a standard halogen bulb costs approximately £4.00 whilst an LED version costs approx. £7.00), LEDs offer a great potential for long term savings. Depending on the size of your household, you could save anything between £245 and over £1434 every year*. Switching to LEDs ensures hassle-free lighting in your home. If you are used to changing your bulbs every few months, you may be surprised that LED lighting lasts 8 times longer, meaning they will work from 20,000 hours (over 2 years)** to 50,000 hours (almost 6 years)***, depending on the quality. There is also no flicker or warm-up time when turning on LEDs. If you are thinking of re-designing your lighting, keep in mind that a good lighting design scheme always ensures your lights are dimmable for the added drama and character. It may be worth mentioning that dimming your lights is capable of saving you a further 20% of energy on average. 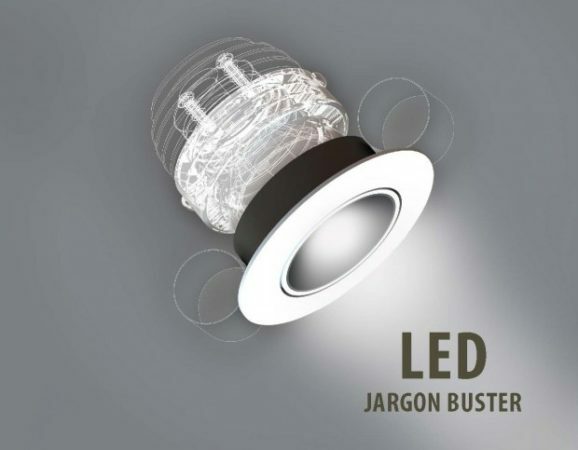 To help you get the most from buying LEDs, we have compiled an LED Jargon Buster booklet to demystify some of the key elements required when selecting the best LEDs for home. It is still worth doing your research and knowing what to pay attention to as there are plenty bad quality LEDs out there. If terms such as CRI (Colour Rendering Index) and Colour Temperature give you a headache, we prepared a little cheat sheet for you to make your transition process more seamless. If you need more advice on our LED technology, call us on +44 (0)20 7371 9000 or email our lighting specialists to sales@johncullenlighting.com or just pop into our King’s Road Lighting Showroom.